Shrimp Scampi is the ultimate Italian Shrimp Recipe with wine, butter, garlic, red pepper flakes and a fresh squeeze of lemon juice. Add the garlic, salt, red pepper flakes, 1/2 of the olive oil and shrimp to a bowl and let marinate for 60 minutes. Heat a large skillet over medium high heat and add the other half of the olive oil and the shrimp (reserve the marinade) to the pan, cooking on each side for 1-2 minutes. 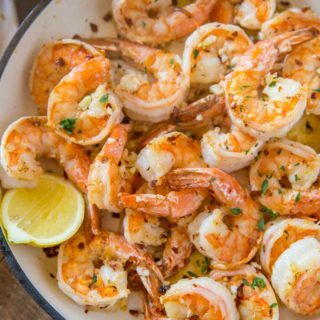 Remove the shrimp from the pan, add in the wine, lemon juice and reserved marinade and cook for 3-4 minutes or until reduced by half before adding in the butter and cooking and additional 3-4 minutes. Add the shrimp back to the pan, toss to coat and serve with parsley as a garnish if desired.